Since we have a webshop all 1958-FlyingV related products like parts, woods and templates you can find now HERE. After finishing our 1959 LesPaul-project we recently followed up with a new one: recreating a vintage correct 1958 Flying V replica. We had to learn that all available plans and routing templates are unfortunately not vintage correct, same with some infos from available books about the Flying V ... so we had to start a journey into the real deal. Few informations and vintage correct dimensions are available publicly, most are not ... so we contacted owners and experts of this rare species, asking for help. We are very thankful for the input we finally got from the people who decided to help, mainly legendary Peter "MAX" Baranet (www.maxguitars.com), David Rogers (from "Dave´s Guitar Shop" in La Cross/WI, www.davesguitar.com, who has an outstanding collection of 350 vintage guitars, check his website for pics of "Dave´s collection") and Tom Wittrock, not just well known as a guitar expert for vintage Les Pauls, who kindly used his network for gathering infos from another owner of an exceptional vintage Flying V. We appreciate your input very much and would like to thank you all again! We got now routing templates made in the style of a vintage real 1958 Flying V for the body, vintage tailpiece (different from anything you can buy anywhere as a "Flying V tailpiece"!) and the headstock lasered as shown below. 1 template for the headstock of the 1-piece neck (use this first, then glue oversized ears to both sides that are larger than the final headstock, then use the other (large) template for the headstock outline to trim the headstock flush to final shape). The humbucker rout is separated into both body templates, just put the one from the back body template on top for this part of the humbucker rout. Positions for all drillings (tuners, bridge, string-through) are pointed by a small hole at the right position, use this for centering the drill of the diameter you will need according the hardware of your choice. Here you can find the above pic in high-resolution for supersizing the details. We believe this is the most vintage correct routing template you can actually find anywhere. Period. Update on the 58 FlyingV-templates: we made a final "full-real-deal-version" and lasered a bunch of sets of routing templates in 6mm birch multiply, click here. You can get any part of the template set individual. Update May 2016: Excellent handselected white Korina wood in, click here. - The Flying V was part of an asymetrical design-approach by Ted McCarty to add to Gibson´s established designs a "future touch". Therefor he designed 3 new solid bodied guitar models: Flying V, Explorer and Moderne (last did not make it to production, seems that even no prototype was made). Additionally there was at least a "Futura" named prototype made, what was a precurser and finally became the Explorer. - First prototyps were made in 1957 and differ (slightly) from the final production. Production started in 1958 (81 made in this year) and was discontinued soon the following year/in 1959 (17 made) due to dissatisfying sales the Flying V was originally a commercial desaster and dealers often just ordered one for decoration of their shop window just as an eye catcher. In the early-60´s some Flying Vs were assembled from leftover factory parts (mainly bodies), but these guitars had different hardware insalled (nickel instead of gold ABR1, no PAFs, not original tailpiece with string-through construction but LesPaul-style stop-bar tailpiece etc.). In mid-60´s, too, Gibson re-introduced the Flying V in an smaller ("squeezed") body shape with shorter and re-designed headstock, using different materials (incl. wood), hardware and colors for the finish. - Pictures from the only yet surfaced prototype (made 1957) you can find here (note that some variations were made for the 1958 production, incl. altering the neck-body-joint and enlarging the e-cavity for the angled switch that was finally used). When inspecting the bottom of the pickguard you will see that it is black - what looks like 3-ply on most pictures that you can find on the web is actually 4-ply (w/b/w/b), last black ply is very thin. Black pickguards were available, too, these were 5-ply (b/w/b/w/b, second black layer from top was a bit thicker than the others). out that are 17.5 wide by 1 5/8 thick. available due to CITES restrictions). thickness, so the thickness of the neck tenon is 1 1/2 inch (body thickness) minus 3/8 inch (thickness of the tongue). See pic below in the gallery at the bottom of this page. - Tailpiece was made of 1.5 mm thick steel that was gold plated. This was not inserted into a recessed rout (as claimed in one of the available plans), but just nailed (sic!) with 3 Escutcheon nails (#12, length: 1 inch) onto the guitar top after this was finished and polished. Seems that the nails (heads) were lacquered. - Headstock was angled by (Gibson´s regular) 17 degree (not 13.5 of 15 or anything else that you can find in plans). Length 7.5 (nut back to tip), width 4.0 inches (widest). Thickness of headstock is tapering due to sanding the back of the headstock on a belt sander (like on vintage LesPauls), at top it measures 15 mm thickness. - Neck angle of minimum 1.5 degree (for comparison: vintage LesPaul´s with carved top have 3.8 to 4.5 degree here) ist needed for TOM bridge (actually this is the absolutely minimum, better go for 2.5 or 3 degrees), the bottom of the tenon was routed with this angle (not the heel of the neck). Vintage Flying V´s were most probably routed at a 3 degree neck angle, but 4 degree seems to exist, too (last found on a 1962 V from the last batch that was made from left over bodies from 1959). string. Side dots were made of Pearloid, too, dia 2,34 mm. construction for protecting the wood - just six naked holes in the wood. Depth of these on the back is just a bit more than the diameter of the ball at the end of a string. - In opposite to other Gibson guitars incl. Les Pauls, the Flying V had no (holly) headstock veneer: after the Korina wood was filled with paste wood filler the headstock was simply painted black while the guitar later got a clear NC lacquer finish after a color coat was applied. This color coat was made of anilin dye (color: canary yellow) and was mixed directly into the (clear) NC lacquer. The color we know from actual vintage V´s is the result of fading over 50+ years, when being new the V´s must have been much more yellow than today. - The Gibson-logo was not inlaid with MOP and no decal was used either, the "Gibson"-writing is an embosed plastic logo of 2.5 inch length (silver or gold), same as used on some Gibson amps of the same period. - Depth of rout of the e-cavity and toggle swith were the same, 1 inch depth. - Tuners were golden Kluson single line, nut made of 6/6 nylon (same was used for vintage LesPauls), nut was 4.65 mm thick at bottom. We do stock a limited number of Korina body and neck blanks as well as the vintage correct material for fretboards from (very) old stock, if interested contact us through email (info AT best-eurospruce DOT com) or use the feedback system at the "Contact" section of this website (see left frame). 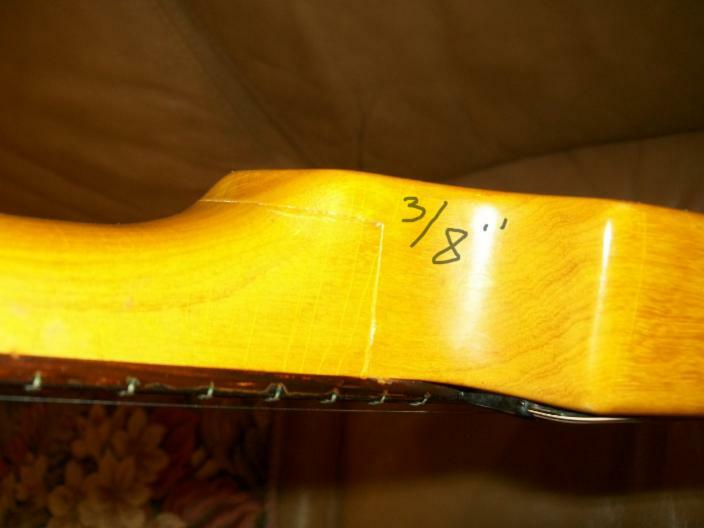 Below you can find a gallery with some pics, showing the building principles of a vintage 58 Flying V - some pics have never been released elsewhere - to give you a better insight in some details of a vntage 1958 Flying V.
Pic below shows the "tongue" that supports the neck (thickness 3/8´´) on a real 1958 Flying V. The curve around the neck-heel-joint varies much on vintage V´s, some are smooth and some are steep. A smoother curve makes the tongue longer. On later re-issues (from mid 60´s to today) this tongue was no more used (even on some ´58 reissues), now the neck (heel) is glued flush to the body, leaving just a small step from the underside of the heel to the back (like on a LesPaul). Some of the pics above are from a collection I gathered over the years - and I do not remember the original poster of the pic. We do not want to harm any copyrights and are glad to add them once we will be pointed to the copyright owner (or will delete any pic if the copyright owner wants us to do so). Please contact us directly prior contacting your lawyer.